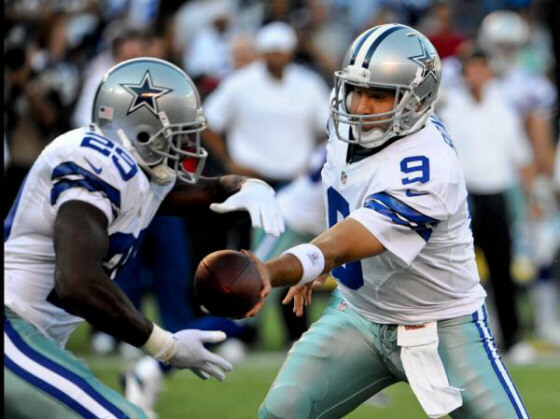 Tag Archive | "Dallas Cowboys on a roll"
Dallas Cowboys are starting to win the games they have customarily lost. A lot is right in North Central Texas these days. The Dallas Cowboys go into the tough confines in Seattle with a record of 4-1 having reeled off four straight wins. DeMarco Murray is playing like an MVP, and the defense, much maligned in the offseason, is competing and doing enough to keep Dallas competitive. The offensive line has gelled very well and three of their last four first-round picks (Tyron Smith, Travis Frederick, and Zach Martin) are steamrolling guys in the running game and keeping Tony Romo upright in the passing game. Yes, I did predict the Cowboys would go 4-12 this season, and I am happily wrong about that prediction. While I thought the defense would be better than last season, I thought they would still be awful this year. I also did not expect the offensive line to come together as quickly as they did. The most impressive thing about the Cowboys this season is that they are making the mistakes they have always made in the past. The difference this season is that they are working through those mistakes where in the past they let those mistakes kill them. Last week against the Texans, the Cowboys had a Murray fumble, a Terrence Williams dropped pass inside the five yard line that cost them a touchdown, and a Tony Romo interception inside the five. They also gave up 10 points in the closing minutes to a struggling offense and missed a field goal at the end of regulation from the reliable Dan Bailey. The Cowboys didn’t get the ball first in overtime, yet a spectacular catch from Dez Bryant set them up for the win. The week before against New Orleans, after controlling the game well into the fourth quarter, the Saints got the ball back down 14 points with plenty of time. Dallas got the stop they needed and then went down the field and scored a touchdown to ice it. In the previous week, they spotted an inferior Rams team 21 points only to fight their way back and get the victory. There was a lot of noise coming out of Cowboys’ camp following their lackluster performance to open the season against San Francisco. The defense did play well in that game despite being put in a lot of tough spots due to the offense’s turnovers and I believe gained much needed confidence for that unit that was shellacked last year. The offensive struggles in that game appear to be more due to rust from Romo’s lack of playing time in the preseason due to injury. A lot of the improved play of the defense this year has to do with the Cowboys controlling the ball on offense with Murray that has kept the defense off the field. The play of Rolando McClain has been a godsend at middle linebacker as replacement for the injured Sean Lee, and J.J. Wilcox has really improved at safety in his second season which has helped the secondary. The unheralded defensive line is competing every week, and this unit is getting turnovers. The better the defense keeps playing, the more confidence they will gain throughout the year. The fact that Dallas is finding ways to win despite mistakes instead of finding ways to lose will also fill this team with confidence. Early season wins for lesser teams typically inhibit them from having a surprise year and doom then to another poor season. There is still a lot of work for this team to do this year, and knowing the Cowboys history, you can never get too comfortable that they won’t self-destruct. Improved play from the defense and finding ways to win, however, is the way to start to write a new script that is a departure from the recent past.